4 bedrooms, 4 bathrooms, salt-water infinity pool, view to die for! Constructed by the owners in 2005, this beautifully situated villa enjoys fabulous views over the pretty town of Fayence. Experience the tranquility of the foothills of the Alpes Maritimes, yet under 30 mins from Cannes and the Riviera. Accommodation of 265sq m. comprises four bedrooms, four bathrooms and an 11 x 7m living room all situated on a 6000 sq.m. plot with a stunning 12x5m, heated, salt water infinity swimming pool. Our ultra-modern bathrooms are equipped with the latest in sanitary-ware and are beautifully tiled. There are heated towel-rails in every one. Air conditioning in all bedrooms added for 2017. Siemens fully automatic bean-to-cup coffee machine with milk frother. If you prefer, there's also a Nespresso machine. fabulous Sonos system with iPhone docking station. Play your own music or use our Napster subscription to stream virtually anything! The house telephone is available for incoming calls and outgoing calls to 82 countries (just about all of Europe + US and Canada) - Landlines ONLY! Further details on request. Incredible villa with wonderful gardens and views. We could not fault this wonderfully appointed, modern villa. The villa has every mod con, including, air conditioning, a built in Siemens coffee machine, Sonos music system, Sky TV, etc. the list is endless,. The comfortable bedrooms are accompanied by quality fitted bathrooms, or shower rooms, a real five star retreat. The views from the terrace, over the salt water infinity pool are amazing, especially early morning, watching the sun rise above the roofs of Fayence, which is perched on the hill across the valley., and well worth a visit. The gardens are immaculate, and maintained regularly, but unobtrusively. The location is also perfect for visiting the French Riviera which can be reached by car within approx 30 minutes. Thanks to Tony for his communication when booking, he made it seamless, with a host of information sent to us prior to arrival, we couldn't have asked anymore. Our only regret is we couldn't stay longer! Having experienced and greatly enjoyed our holiday in this fabulous house in 2015, we came back again this year! The house is really perfect for a family holiday. Spotlessly clean, extremely well kitted out with every need catered for. We have stayed in many houses in the neighboring villages over the years but it would be hard to beat the spectacular views and the joy of sitting on the Terrace at Tony's house. The pool is also one of the best, the salt water is much,much nicer than chlorine.. 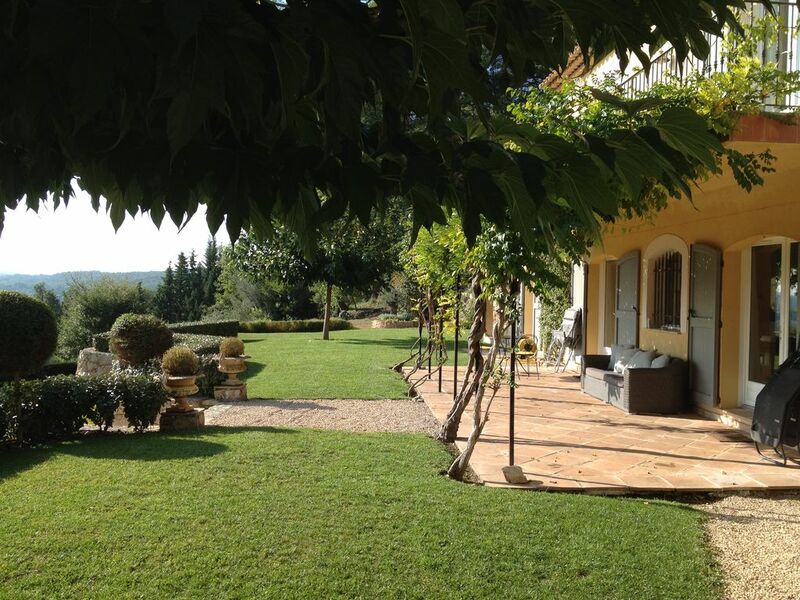 The location is perfect for exploring the area and even for day trips to St Tropez, Cannes etc. I would highly recommend this house and Tony and Christelle were a pleasure to deal with. We had a wonderful week stay at this villa and our only complaint would be that we hadn't booked 2 weeks! The setting of the villa provides the most amazing views across to Fayence with the infinity pool in the foreground. Inside, the villa has everything you would want and expect from a luxury modern home, open plan living space downstairs, Sonos sound system, Sky, outside dining area and BBG, great kitchen with everything you would expect at home and more - 2 fridges, Nespresso machine etc. The bedrooms were stunning and the layout perfectly suited our 2 families and we didn't feel like we were living on top of each other. Great location. Took us 5 minutes into Fayence or to Seillans the other way. 30 minutes to the lake and less than an hour to the beach. Couldn't recommend this more highly. We will be back! We have recently returned from a 2 weeks holiday at this beautiful villa. It is superbly located on a hillside with fantastic views of Fayence. It is really well equipped with lovely open plan living areas, a great kitchen and has good wifi and a full Sky TV package. The house is really spacious and accommodated 8 of us easily, there are so many different areas of the house and garden that we never felt crowded. The location of the house is superb, it is very private but is only minutes away from Fayence - close enough for fresh bread and croissants for breakfast. There are a number of supermarkets nearby and the coast is easily accessible. One of the star features is the terraced garden and the infinity pool, which is illuminated in the evening. The house is well maintained with gardeners, pool cleaners and house cleaners coming during our stay. Tony was at the end of the phone and was very helpful throughout. We cannot recommend it highly enough and certainly plan to return. A magnificent villa in a stunning location with fabulous views, all the peace and tranquility you could wish for and every facility you may want, all in pristine condition. The whole area around Fayence with all its picturesque little villages is a delight and a great destination for a rural idyll. Good restaurants, shops and supermarkets are all minutes away. On a quiet country lane with a superb view of the picturesque little town of Fayence (2km). Further far-reaching views down the valley to the Esterel hills. We are 25 mins from the beaches of Cannes and only 10 mins from the wonderful golf complex at Terre Blanche. Two of the most modern and beautiful golf courses in Europe, Le Chateau and Le Riou – designed by Dave Thomas, one of the finest golf course designers worldwide, are located only 5 minutes away together with a Four Seasons Resort and Spa. Both courses in the Domaine de Terre Blanche offer a standard of care and maintenance that will surely satisfy your demands on an average of 300 days of sunshine throughout the year. In addition, you can enjoy the benefits of the latest technologies from Biomecaswing and the David Leadbetter Golf Academy. Rates are quoted in GBP, but may also be paid in Euros at the exchange rate existing 4 weeks before you arrive. One week bookings (when available) attract a 10% surcharge. We do require a deposit of £1000 (or equivalent in € or US$) upon booking, which will be returned when the house is handed back in the condition you find it. The rental is payable in full 4 weeks before arrival date.